Artist's concept of Mars Express courtesy ESA and J-L Atteleyn. 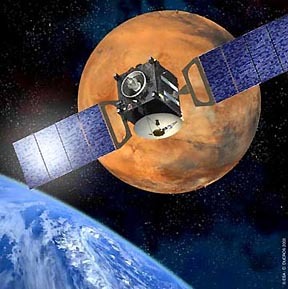 June 2, 2003 Baikonur, Kazakhstan - Today the European Space Agency (ESA) launched its first mission to Mars called "Mars Express" aboard a Russian rocket from Baikonur, Kazakhstan. Attached to the orbiter was Britain's Beagle 2 lander which will land on the surface and look specifically for signs of Martian life. The "robotic geologist" will dig into Mars soil and sample the atmosphere hunting for organic material or methane gas produced by living organisms.